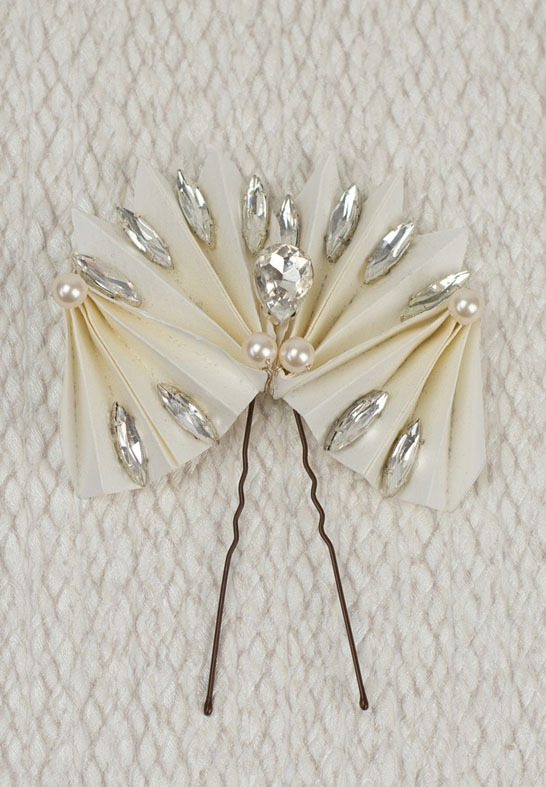 This original Origami Hair Pin with lavish attention to detail is an under-stated yet stylish choice for quirky brides and bridesmaids. Concertina Origami Pieces are inter-woven and folded together to create this striking decoration. The pin features pear and navette cut crystals and Swarovski pearls, which catch the light beautifully. Purdy is light and easy to wear. The design pictured is made in ivory parchment, but as Purdy is handmade to order, it can be made in any paper/colour you wish to match to your theme. The Embellishment measures 7.5cm wide & 6cm tall at it’s longest points and will be presented in a beautiful gift box to treasure forever.